Water and Irrigation Improvement Funding?????? There is money out there to help with irrigation improvements. Along with USDA funding through The Natural Resources Conservation Service and many local Resource Conservation Districts, there are often funds from the state. In Ventura County there is a source of funding that is being made locally administered by the VC Farm Bureau. Check this out and follow some of the threads to find other local funding for improved water management. The drought and groundwater sustainability goals are challenging farmers to use every drop wisely. To help, the State of California has awarded Ventura County a cost share grant with $1.2 million available for technical assistance and equipment rebates to improve agricultural irrigation and energy efficiency. All commercial farms in Ventura County may complete the AWUE Interest Survey for the program. The farming operations with the greatest potential for savings will be invited to begin the program by signing the AWUE Cooperative Agreement (sample available for review at bit.ly/AWUE-grant). Participating farms will have a free, on-site technical evaluation of operations and irrigation system(s) to develop a set of recommendations to improve water and energy efficiency. The evaluation may include a distribution uniformity (DU) test of the irrigation system(s) to determine if the system is applying irrigation water optimally, a review of irrigation scheduling vs. crop need, and other related practices and operational/testing equipment. In conjunction with irrigation efficiency, opportunities for energy savings will also be evaluated. As a cooperative evaluation, innovative ideas that improve water efficiency will be explored for possible recommendation. Equipment upgrades that are mutually agreed upon and implemented within one year at the farmer's upfront cost will be up to 60% reimbursed following a free post-project evaluation. Are there other funding opportunities? 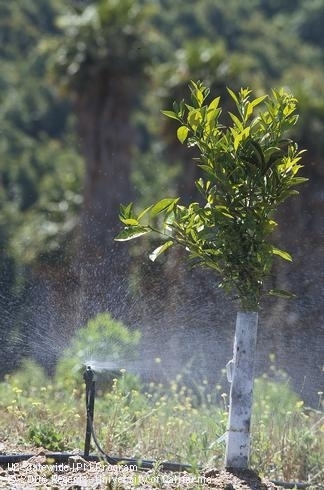 Farmers in Ventura County who meet certain requirements may also be eligible for funding from the USDA Natural Resources Conservation Service (NRCS) to further offset equipment costs of the same water and energy efficiency improvements. This includes special assistance funding for farms located in these Calleguas Creek subwatersheds: Revolon Slough, Beardsley Wash, Las Posas Arroyo and Lower Conejo Arroyo. Contact Dawn Afman, NRCS at dawn.afman@ca.usda.gov or (805) 984-2358 x101 for more information. The AWUE Interest Survey completed by any Ventura County commercial farmer are currently being accepted until funding is exhausted. Surveys will be ranked and those with the greatest potential water savings will be invited to begin the process. NRCS potentially coordinated equipment improvements will receive extra credit in the selection process. Visit bit.ly/AWUE-grant webpage for current grant information. It is recommended that you review the sample AWUE Cooperative Agreement on the webpage to fully understand the program conditions before deciding to complete the AWUE Interest Survey. For AWUE program information questions, please contact Nancy Broschart, Farm Bureau of Ventura County, at nancy@farmbureauvc.com or (805) 289-0155. For field evaluation questions, please contact Jamie Whiteford, Ventura County Resource Conservation District, at jamie.k.whiteford@gmail.com or (805) 764-5132. *This is a cooperative program supported under the Safe Drinking Water, Water Quality and Supply, Flood Control, River and Coastal Protection Bond Act of 2006, administered by the State of California, Department of Water Resources; and the Ventura County Watershed Protection District as the Grantee.